Our tenth article profiles the career of Nenita Ponce de León Elphick. Welcome to this edition of ‘Where are they now’? In this article, we profile Nenita Ponce de León Elphick – UofT 1997. I hope you find this article interesting and maybe even inspirational. Nenita graduated from the University of Toronto (Trinity College) in 1997 with a specialist in Art History, and a double minor in History and German. She then attended Harvard University where she obtained her Masters and PhD in the History of Art and Architecture. She held a variety of academic and administrative positions, and for a time managed a café, wrote for a guidebook, and acted as a cultural consultant for Universal Studios. Her main focus was teaching, research and academic administration; the most recent position was as the Associate Director of History and Literature at Harvard. Her goal was eventually to return to Canada, so after 15 years of being based in Boston, she began to search for positions in Toronto. In July 2012 she became the Program Director of Arts for the G. Raymond Chang School of Continuing Education at Ryerson University. I studied other languages, such as French, Latin and Spanish, but felt I should expand my studies to include a Germanic language. I also needed to be proficient in German to study Art History at the graduate level. When I was an undergraduate, UofT offered a full-year study abroad program at Humboldt University in former East Berlin. This was very attractive, as it was shortly after the Wall had fallen, and there was tremendous excitement about the future of a unified Germany. Through my studies and a year in Berlin, I gained a deep appreciation of German language, literature, and culture. 2. Describe your current position and job responsibilities. What career path lead you to your current job? I oversee all the humanities and social sciences courses and programs that are run through continuing education at Ryerson—over 22,000 enrolments per year. Thanks to my interdisciplinary studies as an undergraduate at UofT, I have a good understanding of the various fields I work with. When I was an undergraduate, the only career advice I got was to go to graduate school. While I might give different advice to undergraduates now, I thoroughly enjoyed the research and writing involved in getting a Masters and PhD. However, when I graduated, there were few tenure-track positions in my field, and none in Canada where I wanted to live. So, I decided to explore how to use my academic experience and skills in other careers. This led me to the administrative side of higher education where I’ve been working ever since. 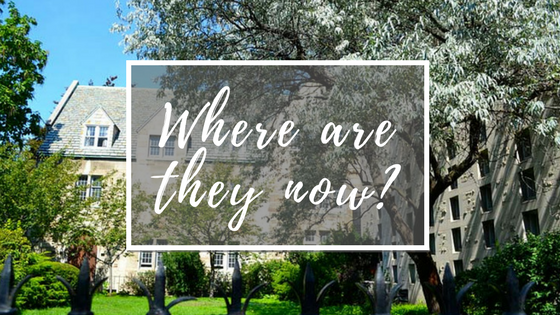 Since tenure-track positions were increasingly rare, I decided early in my graduate studies to gather administrative experience within the university and pursue short-term opportunities in other areas. The many positions I held before and after I finished my PhD ultimately led to where I am now. The things that I miss in my current position are teaching small research seminars and advising undergraduates on their academic and career goals. This is something I did a lot earlier in my career. Every day is different. I sit on many committees and work on instructor and staff hiring, course, and program development, marketing, budgeting, award selection, teaching support, and helping resolve student issues. I also work from home once every few weeks, which allows me to focus on writing presentations, proposals and reports. I have wonderful, collaborative colleagues and I like the variety of activities involved in my job. The rate of innovation and the need for problem solving are also very exciting. Working with computer systems and bureaucratic processes that need to keep pace with the rapid rate of change in higher education. Project management, leadership skills, research and analytical skills, empathy, and the ability to think strategically, outside the box and ‘cross culturally’. As mentioned, I needed German to study Art History, as a lot of important research had been conducted by Germans. Additionally, the ‘soft skills’ that I learned from studying abroad, such as inter-cultural communication and the ability to empathize with different cultural perspectives, have been invaluable. Toronto has an incredibly diverse population and, through my studies, I acquired the skills and experience to manage in this ever-changing landscape. I believe that if you can learn to communicate proficiently in another language, you are able to learn almost anything where you are starting from ‘ground zero’ in terms of knowledge. German, in particular, is very challenging, complex and precise, so it helps discipline your mind. I look at my career not in terms of job titles but rather job satisfaction. I like to acquire new skills, participate in new projects, and ensure my work is meaningful and interesting. I want to continue to work in public post-secondary education, which I think is vitally important for society. I guess it’s my way of ‘giving back’ to a public educational system that has afforded me so many valuable opportunities. I travel as much as I can. I continue to be curious about different countries and cultures and I normally take two international trips a year. My most recent trip was to Costa Rica where I volunteered at a non-profit organization to save sea turtles from poaching and environmental degradation. Sustainability and environmental conservation have become increasingly important issues for me. If you study German, you should take the time to travel and live where it is spoken, in other words, go beyond the classroom. While it’s nice to have a degree that says you majored in German, you should have the goal of becoming proficient in the language and experience its culture firsthand. Studying German can lead to many careers other than a career using German. What you study may not be what you end up doing, but the study of language and literature–and any field in the Arts– trains your brain and teaches you transferable skills such as research, writing, communication, analysis, problem solving, and critical thinking. In a Bachelor of Arts program, you ultimately learn how to learn, and since learning is a lifelong activity and one necessary in today’s Knowledge Economy, you will be well served with these skills. Finally, I recommend that you study what you love, while building up your work experience through summer employment and internships. This way a prospective employer can see both your intellectual abilities and your ability to function and grow in a professional environment.